I have an electric garden tractor made by GE back in the 70’s. It has six – 6V golf cart batteries wired in series to make a 36V system. While this isn’t a high voltage the amount of current that they can produce can be dangerous. In this case the sheet of metal you see carries all the current for the drive motor and the connection on the lower end corroded. 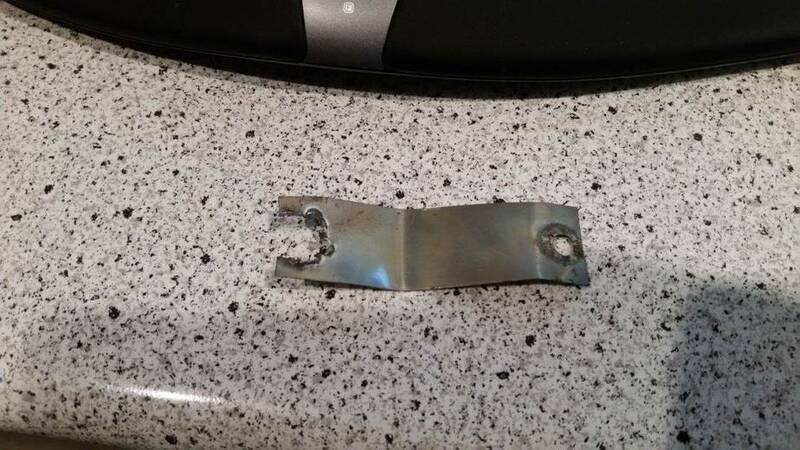 This raised the resistance which caused sparking strong enough to blow away metal (see top picture) and even caused the metal to glow red. Current is what is needed to weld metal in an arc welder. Batteries can provide a lot of current for a short period of time. When working around car sized batteries be careful that your wrench doesn’t connect across something connected to the positive side to the car frame, which is connected to the negative side. This is a particular risk when dealing with the starter, it has a thick cable running directly to the battery. 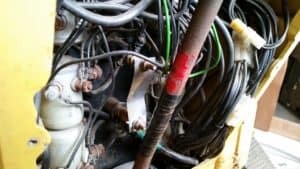 If while removing that cable your metal wrench touches almost any exposed metal you will be creating sparks and possibly ruining some cabling, your wrench, burning yourself or starting a fire. An old saying from my electrics teacher is “It’s the volts that jolts, but the mills (amps, current) that kills. Just because something like a 12V-36V will not shock you, doesn’t mean it wont cause considerable damage once that current gets flowing through something with less resistance than your body.